Register Log In ECN Forum Forums Photos for General Discussion Another "Odd" looking sign! 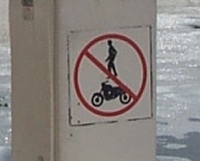 "No Walking On Top Of, Walking Over, Or Standing Above Motorcycles, Allowed Around Here!!!" Looks like there has been some problems in the past, with People walking the wrong way when Motorcycles are involved! Hope you got a laugh! When I was young and Evil Knievel was in the news quite regularly we used to joke that it meant "No stunt riding allowed." is no mistaking the result if you open the cabinet and mess around! 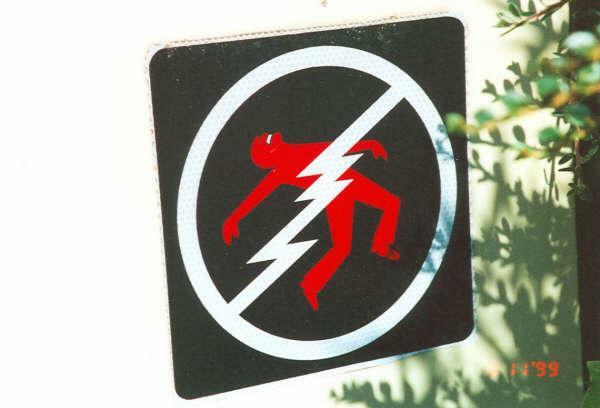 Hmm, "Anyone limbo dancing will be shot with a phasor NOT set on stun"? Is that a dead Reddy Kilowatt? ?